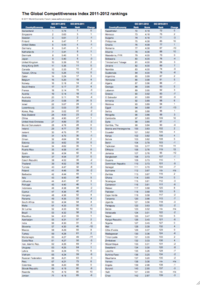 Latest Competitiveness ranking via the World Economic Forum. Egypt ranks number 94 among 142 countries. Egypt ranks number 94 among 142 countries in the Global Competitiveness Index of the World Economic Forum, dropping 13 places since the last report covering 2010-2011.